Champions are those that in the face of adversity are resilient. 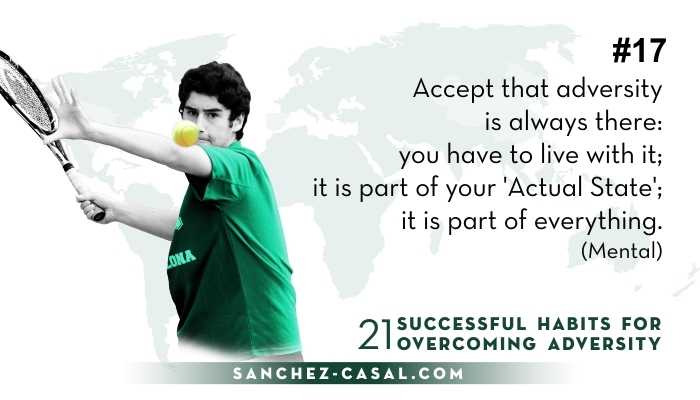 This is quote 17 of a series launched by Emilio Sánchez Vicario under the title ‘21 Successful Habits for Overcoming Adversity’. In his previous articles, Emilio has linked together personal experiences with other people’s stories of progress and improvement, with adversity as the underlying theme. The 17th quote is entitled, ‘Accept that adversity is always there: you have to live with it, it is part of your ‘Actual State’, it is a part of everything.’ In this article, we wanted Emilio to explain why he choose adversity as the underlying theme of this series, and what it means to him. Enjoy the pressure. Feel it, like it, savor it. You’ve worked so hard to arrive to this moment and now you are READY. By Emilio Sánchez Vicario, CEO & Founder at Sánchez-Casal Academy. The Davis Cup is different. It is something special that arrives at the end of every year bringing incredible stories full of emotion. The result of this energy that turn out epic matches. This year, Argentina’s story touched my heart.